What more can I say? 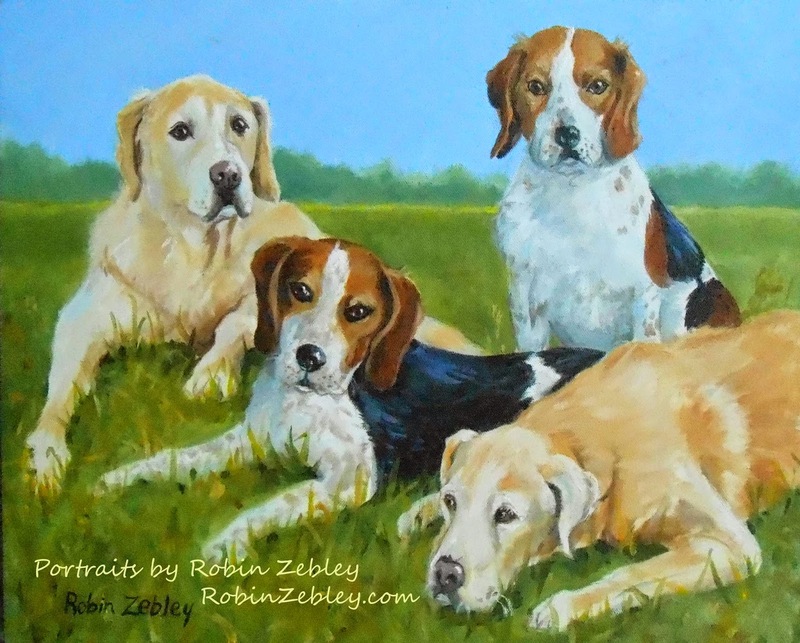 Pictures speak louder than words (although I am a real gabber), so here's more samples of my custom pet portraits and custom house portraits. 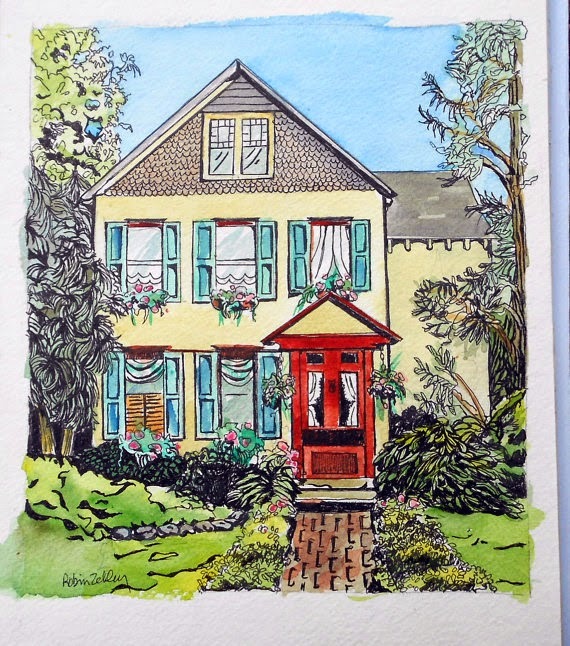 I'm in the Philadelphia area, and the house below is from my neighborhood! 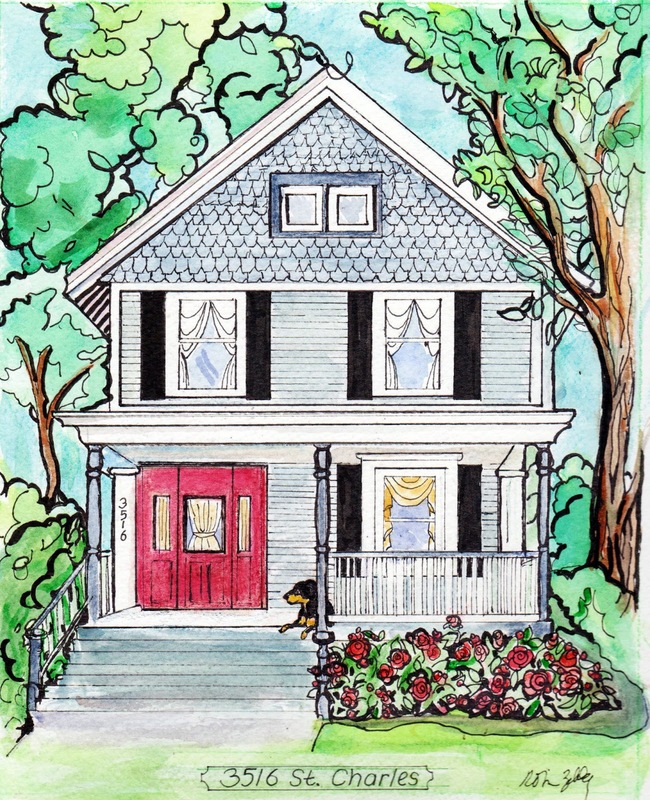 But I paint and draw homes and pets from all over the country, all I need is your photos! 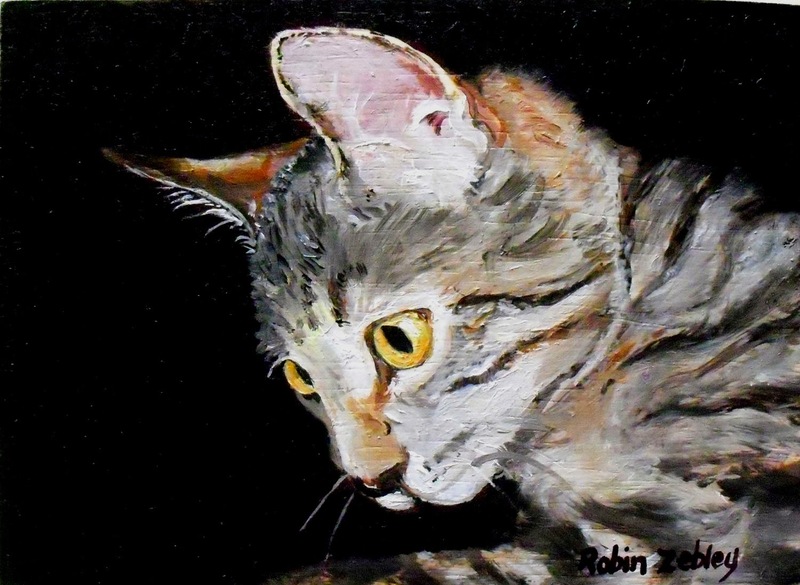 I create portraits from an array of your photos, the tabby cat portrait above is an oil painting. I started out in colored pencil, I just love the detail and lush color I can get by pushing this unusual fine art medium to its limits! Here's two Golden Retrievers' portraits I finished recently. 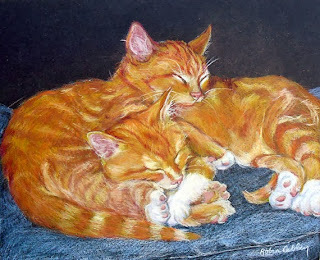 They are brothers, and I loved their expressive faces and wanted their personalities to show through in their portrait. How do I capture their unique personalities? I will ask you to tell me something about them. I feel like when I know more about them, it comes through, and shows in their beautiful eyes. 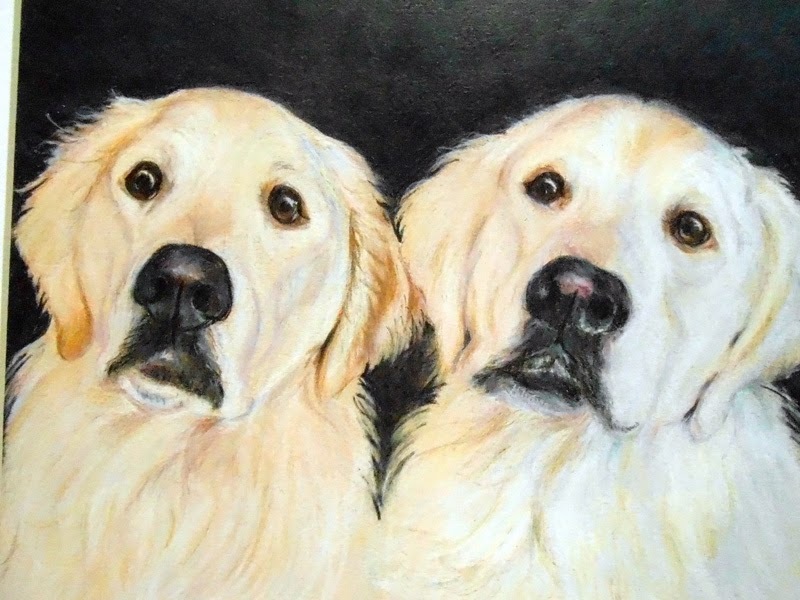 It is so important to me that your portrait look like YOUR Golden Retriever, not just A Golden Retriever, you know? 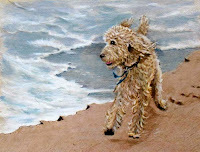 I have been creating custom portraits from photos for over eleven years for happy clients all over the world! I work from your photos, usually a combination of them. 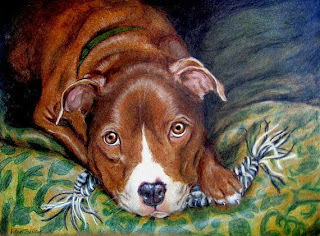 My studio is in my 1922 bungalow just outside of Philadelphia, on the way to Wilmington, where I am kept company by my boxer, Sarge. I know how precious pets are! Memorial Portraits are so special, and I'm honored to be chosen to create a remembrance that I know will be treasured forever and bring a smile as they remind us of the joy and happy memories of our beloved pets. No perfect photo? 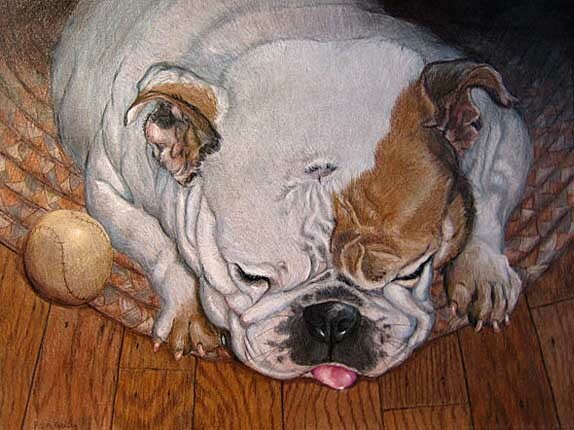 This adorable English bulldog was not lying on a wood floor, no rug, no beloved baseball next to him! 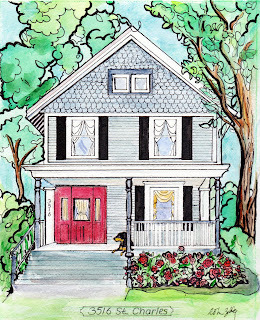 I worked with his "mom" to add in details to make a pleasing composition AND added details to make it meaningful! Questions? Please just ask! My email is HERE. I'll respond within hours, usually. So go get those photos together and let's create a special work of art!